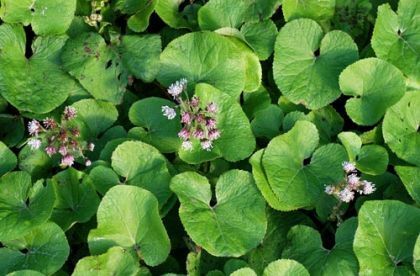 Winter Heliotrope is not easily confused with other wild plants on this web site. Strongly scented, some say vanilla, some say liquorice, this is one of our most widespread winter plants. Found on both waste and cultivated ground, it carpets damp places, embankments and shady roadsides, flowering from November to March. The flowers are pale pink, in heads 10-15mm across, and these are borne in spikes up to 25cm long. Male and female flowers are carried on separate plants, the male flowers having mostly tubular florets and few rays, the female having many short rays. (I am not sure if there are any female plants found in Ireland; only male plants are found in mainland Europe and Britain.) The distinctive shiny-green leaves are kidney-shaped, hairless above, hairy below, not angled but regularly toothed. This plant is not a native plant but has escaped from gardens and large demesnes where it was planted originally for ground cover. It is very invasive as it can regenerate itself from a very small part of its fleshy rhizome and also seeds itself by means of a small pappus. It belongs to the family Asteraceae. My first record of this plant is in 1977 when I found it growing beside the railway in Dalkey, Co Dublin. I photographed it near Blackhall Strand, Co Wexford in 2006. Heliotropism is the daily movement of plants in response to the direction of the sun. The flowers and leaves of this heliotropic plant gradually follow the sun from east to west and during the night turn back to the east to greet the next dawn. 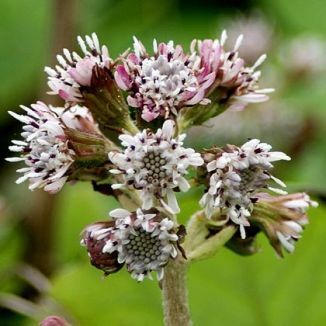 A very valuable source of winter feeding for bees, Winter Heliotrope was often planted near their hives specifically to provide nutrition to them during winter.